ConFoo 2013—Call for Papers is Now Open! 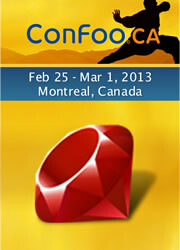 ConFoo is one of the most important developer-oriented conferences and includes Ruby content. ConFoo 2013 will be held on February 25 through March 1 in Montreal, Canada.